Mastercraftsman (Johnny Murtagh purple cap), Delegator (Jimmy Fortune blue cap) and Lord Shanakill (Jim Crowley green cap). Irish 2,000 Guineas winner Mastercraftsman justified 5/6 favouritism to take the Group One St James’s Palace Stakes by a neck after fighting off the persistent challenge of Delegator. Trainer Aidan O’Brien was full of praise for the winner and said: “It’s unbelievable - a great performance from both jockey and horse. He’s an amazing horse - speed, stamina, soft ground, fast ground - they all come alike to him. It was a great performance by the horse and a marvellous performance by the jockey. "His most impressive performance was in a Group One over six furlongs on good to firm ground in the Heinz (Phoenix Stakes) last season and he’s a Guineas winner and a St James’s Palace Stakes winner - an amazing horse. "When everybody decides to step him up to a mile and a quarter I don’t think that he will have a problem with that either. He’s just one of those great horses. He’s becoming very like a Giant’s Causeway, the sort of horses that don’t mind a mile or a mile and a quarter. “He’s a big, straightforward horse and is very uncomplicated - he just jumps out and you let him roll. He’s a great cruiser with loads of class. “Johnny said he’s very idle when he hits the front but watching the race I knew that Johnny didn’t think that he was beat. 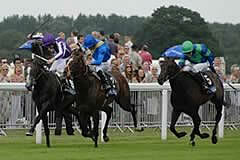 Jockey Johnny Murtagh added: "It was going very well - there was a nice pace and I pulled him into the straight. I committed him early enough and he was a bit lazy when he hit the front. He did hang on and wait for Delegator but when Jimmy came to me, he came there good, but you can see that my horse’s head is down and he is really trying. “I knew it was going to be a battle but I was getting well on top in the final 10 strides. "He gave 110 per cent, he’s brave, courageous and he’s like all of the great horses I ride for Ballydoyle - they never know when they are beaten, he’s just like Henrythenavigator and Duke Of Marmalade last year. He’s right up there with the best. "After winning a Guineas and a St James’s Palace Stakes over a mile, he’s not short of speed and I think that he is a true champion. The way he did it today, I think that he deserves a lot of credit. Delegator, who was second to Sea The Stars in the 2000 Guineas, again had to settle for runner-up honours when being out-battled by odds-on favourite Mastercraftsman in the St James’s Palace Stakes. 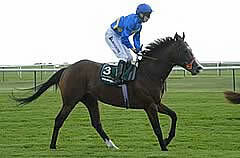 Karl Burke, trainer of third-placed Lord Shanakill, said: “When he went with them I knew he’d keep battling to the line. He has an entry in the Prix Jean Prat and we’ll look at the Sussex, but we’ll see how he comes out of this.